For the similar enemy in Donkey Kong Country: Tropical Freeze, see Pufftup. Puftups are blowfish enemies that first appeared in the game Donkey Kong Country 2: Diddy's Kong Quest. They have made various appearances since. Puftup's name comes from the fact that it is "Puffed-up". 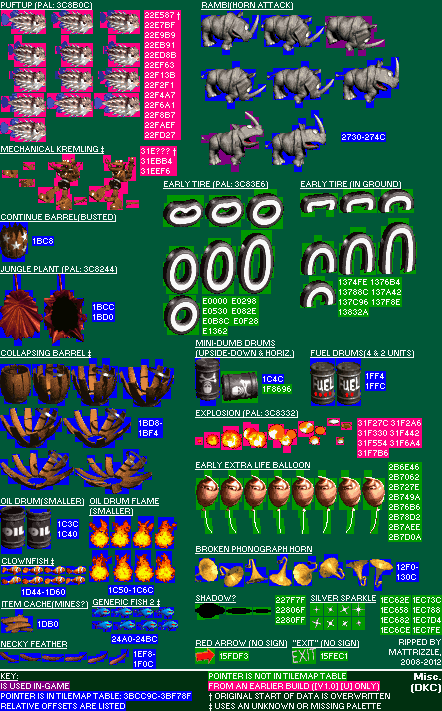 Puftups do not appear in Donkey Kong Country, but ROM hacking shows there to be unused sprites for Puftup, which were carried over to Donkey Kong Country 2. Puftups appear as semi-common underwater enemies of the "Submerged Seadogs" class in Donkey Kong Country 2. Their main attack pattern was to either inflate largely, posing as obstacles, or inflate and quickly explode, sending spikes in various directions. As with most underwater foes, Enguarde's bill stab will make quick work of it, though Enguarde himself is vulnerable to the Puftup's spikes. Puftups return in Donkey Kong Land 2. They no longer puff up and explode in this game, likely due to hardware limitations. Puftup, as seen in Donkey Kong 64. Donkey Kong 64 marked their next appearance after an absence from Donkey Kong Country 3. Puftups in this game are purple, but if approached by a Kong they will explode, as if an underwater mine. Also, the boss of the area, Gloomy Galleon, is a giant Puftup named Puftoss. In Banjo-Tooie Puftups were recycled as Swellbellies. This enemy is almost identical to the Donkey Kong 64 Puftups, except for their red coloring. These pufferfishes are found in Atlantis, Smuggler's Cavern, and Seabottom in Jolly Roger's Lagoon. They can be defeated by the Talon Torpedo or when a Grenade Egg is fired at them. Puftups appear in DK: Jungle Climber being absent from a new Donkey Kong game for eight years. If DK or Diddy charges into them while deflated, they will be defeated. In Donkey Kong Country: Tropical Freeze, a similar enemy appears and has a similar strategy. It also has a very similar name, Pufftup. This page was last modified on 2 February 2017, at 19:37.